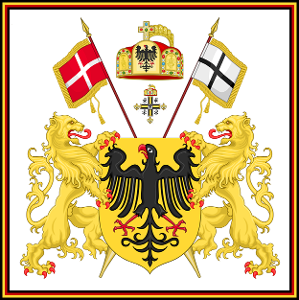 The Heraldic Council of the Holy Roman Empire is an Imperial corporation and Heraldic authority, consisting of professional officers of arms, with sole Heraldic jurisdiction over the whole of the territory and lands of the Holy Roman Empire. The Heraldic Council was created in 1963, Its prime task is to supervise the granting of Coats of Arms and the protection of the usage of all Imperial Armorial Bearings and Heraldic devices of the Holy Roman Empire. The Chief Herald of the Heraldic Council of the Holy Roman Empire is the Reichsherold or Imperial Herald, The Chief Herald authorises the granting of arms and the right to use arms in the whole of the territory and lands of the Holy Roman Empire. An application for a grant of arms should be made to the Chief Herald, by formal petition, setting out, in the case of a personal application, basic personal information and accompanied by supporting certificates or other appropriate documents. 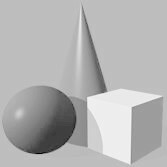 If an application appears to be in order the matter is considered in detail by a Herald of Arms who will consult with the applicant about possible designs. A preliminary painting is then made for the approval of the applicant who will also be shown a draft of the Letters Patent. 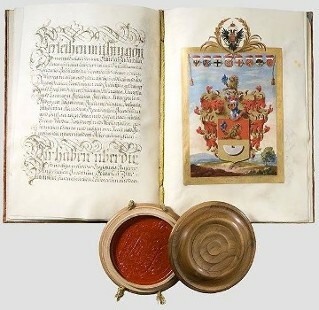 The final document is issued on vellum and includes a hand-painted exemplification of the arms. 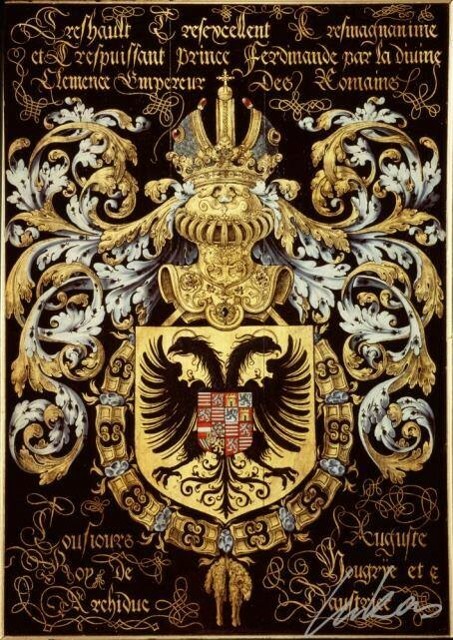 The grant of arms will be recorded and listed in the Imperial Register of Arms of the Holy Roman Empire. The Imperial Court of Chivalry or the Chief Heralds Court, is presided over by the Chief Herald of the Heraldic Council. The court has jurisdiction over all matters relating to heraldry as it legalises and enforce decisions of the Imperial Court of Chivalry. The court considers all cases relating to questions of status, including disputes over heraldic matters and the law of arms, for example complaints on the infringement of the use of another individual's coat of arms, without due permission and or rights held and pertained. The Reichsadler ("Imperial Eagle") was the heraldic eagle, derived from the Roman eagle standard, used by the Holy Roman Emperors and in modern coats of arms of Germany, including those of the Second German Empire (1871-1918), the Weimar Republic (1919-1933) and the "Third Reich" (Nazi Germany, 1933-1945). The same design has remained in use by the Federal Republic of Germany since 1945, but under a different name, now called Bundesadler ("Union Eagle" or "Federal Eagle", from German "Bund", genitive form "Bundes" meaning 'Union' or 'Federation', and "Adler" meaning 'Eagle'). 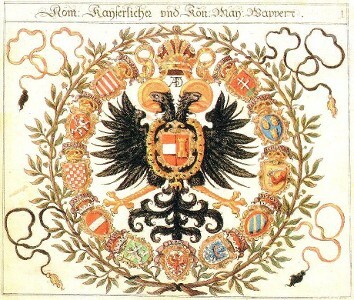 One rendition of the coat of the empire was the "Quaternion Eagle" printed by David de Negker of Augsburg, after a 1510 woodcut by Hans Burgkmair. It showed a selection of 56 shields of various Imperial States in groups of four on the feathers of a double-headed eagle supporting, in place of a shield, Christ on the Cross. 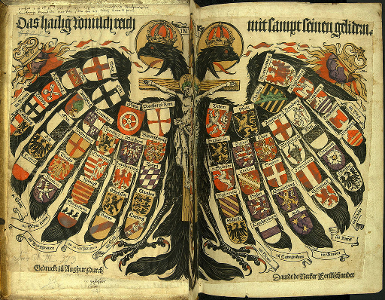 The top, larger shields, are those of the seven Prince Electors, the ecclesiastical: Trier, Cologne and Mainz as well as of the titular "Prefect of Rome" on the right wing; the secular: Bohemia, Electorate of the Palatinate, Saxony and Brandenburg on the left. From the reign of Albert II (reigned 1438–39), each Emperor bore the old Imperial arms (Or, an eagle displayed sable beaked and membered gules) with an inescutcheon of pretence of his personal family arms. This appears therefore as a black eagle with an escutcheon on his breast. Before 1438 the Emperors used separate personal and an imperial coat of arms. The arms of the High Offices of the Empire were borne as an augmentation to the office-holder's personal arms. Turino armorial (1312), descriptions of 119 coats of arms of the attendants of the coronation of Henry VII. The coats of arms shown with the singer portraits in Codex Manesse (although not technically an armorial) are an important source for early 14th century heraldry. The Codex Manesse, Manesse Codex, or Große Heidelberger Liederhandschrift is a Liederhandschrift (book of songs/poetry), the single most comprehensive source of Middle High German Minnesang poetry, written and illustrated between ca. 1304 when the main part was completed, and ca. 1340 with the addenda. 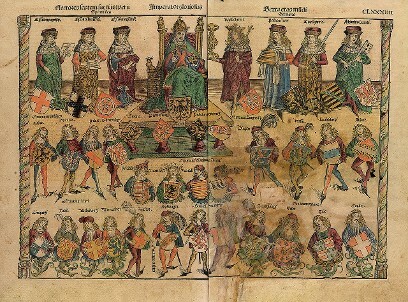 The codex was produced in Zürich, for the Manesse family. The manuscript is "the most beautifully illumined German manuscript in centuries;" its 137 miniatures are a series of "portraits" depicting each poet. The Codex Manesse is an anthology of the works of a total of about 135 Minnesingers of the mid 12th to early 14th century. For each poet, a portrait is shown, followed by the text of their works. The entries are ordered approximately by the social status of the poets, starting with the Holy Roman Emperor Henry VI, Kings Conradin and Wenceslaus II, down through dukes, counts and knights, to the commoners. Most of the poems are Minnesang, but there are also other genres, including fables and didactic poems. The oldest poets represented in the manuscript had been dead for more than a century at the time of its compilations, while others were contemporaries, the latest even late additions of poems written during the early 14th century. In the portraits, some of the nobles are shown in full armour in their heraldic colors and devices (therefore with their faces hidden), often shown as taking part in a joust, or sometimes in single combat with sword and shield, and sometimes in actual battle. The Zürich armorial made in c. 1340 presumably in what is now eastern Switzerland (in or nearby of what is now the canton of St Gallen), now in the Swiss National Museum in Zürich. The Zürich armorial (German: Zürcher Wappenrolle) is a roll of arms made in c. 1340 presumably in what is now eastern Switzerland (in or nearby of what is now the canton of St Gallen); it is now kept in the Swiss National Museum in Zürich. The document was owned by Zürich naturalist and historian Johann Jakob Scheuchzer (1672–1733). Its previous history is unknown. It was given to the Zürich city library by Scheuchzer's nephew in 1750. The Zürich armorial is one of the oldest and most important surviving collection of arms of the lower nobility of the Holy Roman Empire. Its geographical focus is that of greater Swabia, including the Lake Constance area, German-speaking Switzerland, Elsass, and Baden. It consisted of four parchment strips each of a width of 12.5 cm and a combined length of four meters. One of the four parts was lost; on the surviving three parchment strips, a total of 559 coats of arms and 28 flags of bishoprics are depicted. 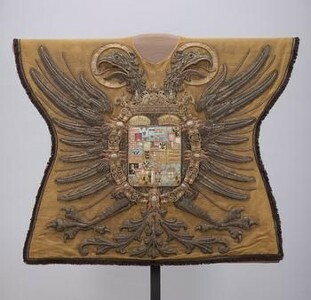 A further 108 coats of arms depicted on the lost portion survive in manuscript copies, including one in the library of the counts of Königsegg-Aulendorf and one made by Hans Conrad Bernhauser (1698–1761) kept in Zurich Central Library. Gelre Armorial is a Dutch roll of arms dating from c. 1370–1414, containing about 1,700 coats of arms. It currently resides at the Royal Library of Belgium. The armorial was compiled before 1396 by one Claes Heinenzoon (or Heynen, fl. 1345−1414) who was a herald in the service of the Duke of Guelders and also the creator of the Beyeren Armorial. The book displays some 1,800 coats-of-arms from all over Europe, in color, and is one of the most important sources for medieval heraldry. The Gelre Armorial manuscript is nowadays preserved in the Royal Library of Belgium (signature code ms. 15652-5). A copy from around 1500, produced by Cornelis Enghebrechtsz, is preserved in the library of Hoge Raad van Adel (nl). This version, however, only contains 1400 arms. From 1880 to 1905, Victor Bouton produced 60 copies with hand-coloured arms. Wappenbüchlein E.E. Zunft zu Pfisten in Luzern (1408), 5 foll. with 59 Lucerne guild coats of arms. Hyghalmen Roll is a German roll of arms made around 1447–1455 in Cologne. It currently resides at the College of Arms in London. The Hyghalmen Roll is a roll of arms kept at the English College of Arms in London (1st MS. 5). It was made c. 1447–1455 in Cologne, Germany. Some images show characteristics of German heraldry, such as repeating themes in the coat of arms and crest, and the long schwenkel on banners. The latter was omitted from the attributed arms of Jesus when the images were copied into Randle Holme's Book (c. 1464–1480). Hans Ingeram's armorial (1459), 280 pages with c. 1,100 coats of arms. Wappenbuch der österreichischen Herzöge, c. 1445–1457, 50 foll. with some 170 coats of arms. Wernigerode Armorial is a Bavarian roll of arms from around 1486–1492, containing 524 pages, 477 of which are illustrated with anywhere from one to thirty coats of arms (most of these have four coats of arms each). 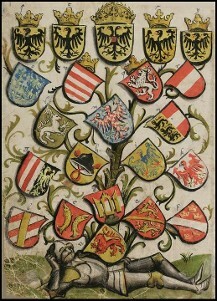 The Wernigerode Armorial (Bavarian State Library Cod.icon. 308 n, known in German as Wernigeroder Wappenbuch or Schaffhausensches Wappenbuch) is an armorial compiled in southern Germany (possibly near Nördlingen) in the late 15th century (between 1486–1492). The book was formerly in possession of the Schaffhauser family of Schaffhausen, Ehingen am Ries, near Nördlingen, later kept in the Stolberg library of Wernigerode (signature Zi 33), with the dissolution of this library in 1927/8 passing into the private possession of Otto Hupps, and finally bought by the Bavarian State Library in 1949. The manuscript is the first of originally two volumes; the second volume has been lost. A third volume consists of a register to vols. 1 and 2, kept in the Halle University Library (signature Halle, UuLB: Zi 33). It is an important witness of the transitional period from medieval to classical (early modern) conventions of heraldry (e.g. the papal arms are shown with the keys of Peter crossing behind the shield, a fashion which only gradually became adopted by the popes themselves during the 16th century, while the crossing keys above the shield were first used a few decades earlier, c. 1420s). On 261 folia it presents various coats of arms, as was the custom at the time in order of descending rank, beginning with a number of purely fictitious or symbolic coats of arms, that of God, of Jesus Christ, of Death, of the "first arms" of kings Abysay, Sabytay, Banabias, of "King Alphonsus of Castilia", "the holy King Job", the "holy knight Eustachius", followed by the (real) royal arms of Sweden, Austria and Thuringia, and the attributed arms of the Nine Worthies. After this, the armorial presents the actual coats of arms in use at the time, beginning with the papal arms of Innocent VIII, the imperial arms of Habsburg Austria and the Imperial Eagle of the Holy Roman Emperor, the royal arms of France (already attributed to Godfrey above), England and Greece. More royal and ducal arms are given, partly real and partly fictitious, including those of the Dauphin, Wessex, Italy (kingdom of Naples), Ireland, Outremer (the Jerusalem Cross), and of "Calistria, queen of the Amazons", Brittany, "the great Khan", Arabia, Nineveh, Granada, Bavaria, Hessen, Bavaria-Straubing and the Duke of Teck, Lorenzo de' Medici, the "Sultan of Jerusalem", some "eastern empires" such as Persia, India, Prester John, "Constantine" (Byzantium, showing the arms of the Latin Empire), Cathay (China), Scotland, Aragon, Denmark, Sweden, Norway, Iceland, Poland, Antiochia, Ethiopia, Salerno, Castilia, Troy, Nebuchadnezzar, Nero. After this preface, the book begins a more realistic listing of the heraldry of its time, beginning on fol. 20v, organized as follows: The arms of the territories and noble families of the kingdom of Spain, of the high nobility of the Holy Roman Empire, Burgundy, Savoy, Milan and Naples (ff. 20-29); the higher nobility of the Holy Roman Empire in the duchies of Kleve, Geldern, Liegnitz, Werdenberg, Württemberg, the Habsburg territories, and the arms of various counts (foll. 29-85). This is followed by the arms of lower nobility and certain notable bourgeois families (foll. 86-255) and the arms of imperial cities (foll. 257-262). Stemmario Trivulziano is a Milanese roll of the second half of the 15th century, containing approximately 2,000 coats. It currently resides at Biblioteca Trivulziana, Milan, Italy. Attributed to Gian Antonio da Tradate, it was in the possession of Gian Giacomo Trivulzio, who served as a Milanese condottiero between 1465 and 1483. It blazons the ducal arms and those of linked families such as Brandolini, Savelli, Colonna, Orsini, Scaligeri, Este and Gonzaga. Also included are the arms of the German merchant-bankers Fugger. Scheiblersches Wappenbuch, c. 1450–1480, 624 coats of arms. Armorial of Conrad Grünenberg, Constance (1483), some 2,000 coats of arms. Palatine armorial, c. 1460, 200 foll. with 1,080 coats of arms. Miltenberg armorial, late 15th century, 85 foll. with c. 1,700 coats of arms. Innsbruck armorial, c. 1460s, 157 foll. with 408 coats of arms. Gerold Edlibach's armorial of Zürich, 1490s. Gerold Edlibach (24 September 1454 – 28 August 1530) was a chronicler and official of Zurich, author of the Zürcher Chronik. Gerold Edlibach lane in Greifensee, Zürich, the Greifensee Reformed Church in the background He was born to Ulrich Edlibach and Anna Landolt of Einsiedeln. His mother was from a wealthy family of ironmongers, who after her first husband's death married the mayor of Zurich, Hans Waldmann. Gerold Edlibach married Ursula Röist, with whom he had a total of 18 children. He was employed by the Einsiedeln Abbey to manage its property in the city of Zurich during 1473 to 1480. He was elected to the city council in 1487, but he was forced to retire after the execution of his step-father in 1489. He sat in the council again during 1493 to 1499 and during 1515 to 1524. He acted as a reeve for the city in Bülach in 1488, in Grüningen during 1494 to 1498 and in Greifensee, Zürich during 1505 to 1507. As an opponent of the Reformation in Zürich led by Ulrich Zwingli, he opted to retire from all offices in 1524. His main work is the Zürcher Chronik which documents the history of the Old Swiss Confederacy from 1431 to 1530. The portion covering the time up to 1486 is partly based on the illustrated chronicle by Diebold Schilling the Elder. Edlibach extended the 1486 work adding his own account of contemporary events until his death in 1530, although entries become noticeably briefer after 1517. The manuscript is kept at the Zurich Central Libra Edlibach also published a Zürcher Wappenbuch in the 1480s, an account of the Waldmann scandal of 1489 (Waldmannscher Auflauf) and a glossary of Rotwelsch (fickabel des rotwelschtz) in 1490, besides various notes on the Reformation during 1520 to 1527.